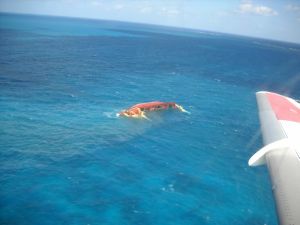 The 206 foot motor vessel Mystic capsized and sank near Damas Cay, Bahamas. The vessel requested assistance after it had struct a submerged object resulting in water ingress into the vessel. The crew attempted to pump out the water, but the rate of water ingress was too much. The 10 member crew abandoned the vessel into liferafts when the vessel was close to capsizing. All 10 crew onboard were rescued and reported safe. Reports state pollution is likely to be released from the 8000 gallons of diesel fuel onboard the Mystic when it sank.